There are actually TWO new projects here in these pictures. 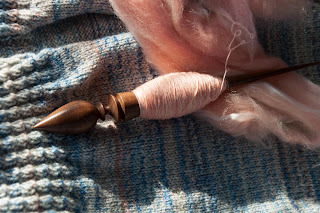 The topmost pretty pink on the spindle is my supported spindle project on a Texas Jeans russian walnut spindle. The spindle is magnificent to spin as the flicking tip is very fine and spins incredibly fast and easily. 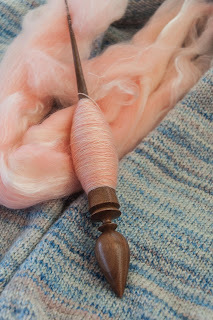 The fiber is a blend of merino and tencel in pink, peach, and silky white and is gorgeous. The spindle is resting on my handspun raglan cardigan, in progress. It will be a top-down cardigan with a shawl collar. The yarn is 3-ply handspun polwarth and silk wool and is about a sport weight. The pictures were taken last night in the fading sunlight on my boat as we travel up the Chesapeake Bay on our way to St. Michaels. I enjoy your blog very much, but don't think I have left a comment before. You have some lovely projects and I particularly like the lace shawls you've made recently with your own handspun yarn! So much in fact that I'm contemplating taking a supported spindle spinning class with Fleegle! I'm going to think about it overnight.